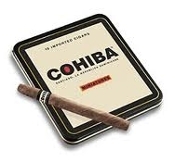 Cohiba combines long-aged Dominican Cuban-seed fillers, rare Indonesian Jember binders and savory African Cameroon wrappers. This combination makes a rich balanced creamy smoke. Very popular cigar that will always leave you wanting more!